Today, May 18 is the celebration of town fiesta in Donsol, a small town in Sorsogon where I grew up in. I am looking forward to talking to my Mom tonight because she is in Legazpi to get the money I have sent the pother day. It was two years ago when we first visited Philippines since I left. We were still in Korea back then. We took opportunity of flying there going to the Philippines as it was closer and less expensive. 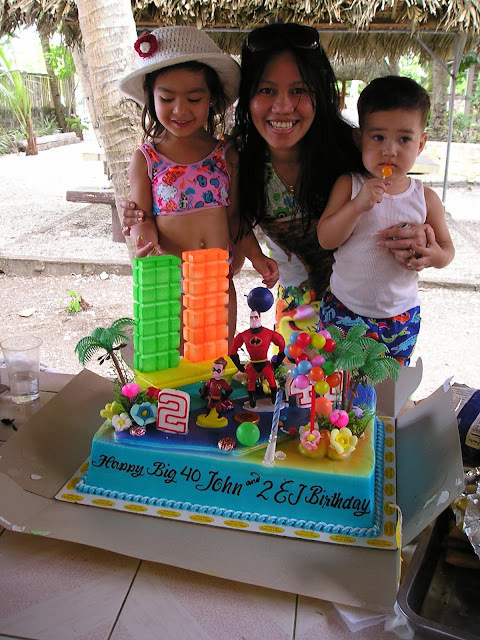 It was also a very special trip because we celebrated both of my husband and son's birthdays with my family. My eldest brother was still alive then two months after that we came back again for his funeral. It was painful to get back there knowing that we have to bury a love one. 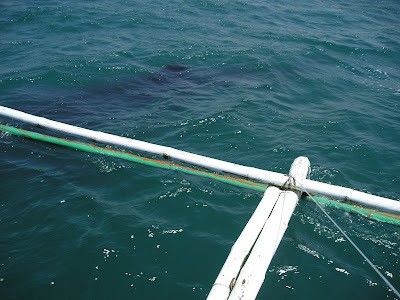 Some of the photos we took when swam with the butandings or whaleshark. Before you leave, would you mind helping Miracle Players Foundation generate funds for children with cancer. For every like that they receive in Facebook page, TechInsurance will donate $1 to Miracle Players Foundation so it is like donating one dollar when you spare a minute and like the page. Thank you for your support! There's only one request I am asking after you link up, please leave a comment if you can about the post. Thank you for playing this week once again. 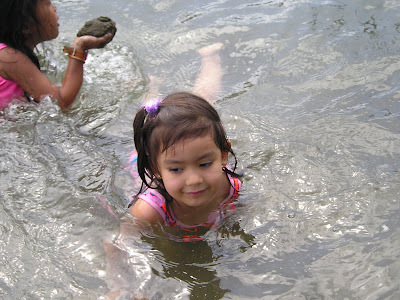 Swimming with a "Butanding" is quite an adventure! I love the beautiful pictures! Mr. Burrito seem to be in a bad mood while Ms. Burrito is having fun and looking beautiful as always. Must have been fun to see a butanding up close! I am sorry to hear about your brother, Rose. I am sure he is in a better place now. Ang sasaya naman ng mga kuha nyo. Sabay ba ang bday ni Mr. Buritto at ng dakilang ama ng tahanan? Hehe! Endangered Specie ba yang butanding? Mukhang wala yan dito samin, LOL! Ang bilis talaga ng panahon~I still remember your post about the death of your brother..
Hahaha Korek ka dyan sis, he poke the cake kasi with his fingers before we could light the candle up so I told him about and he did not like it kaya he was in the pissy mood na when the picture was taken..
Looks like everybody had fun! enjoy ata sila sa dagat, hehe. missed joining ur meme, rose. the scanner's not yet working forcing me to use the cam on old fotos, instead. di pa ko nakakita ng butanding in real...sa TV ko lang to napapanood hehe...bat naka simangot si EJ hahaha. up na sa akin Rose..wala nga lang pic. ako din....haven't seen them yet...sarap naman tong adventure nyo sis...parang kelan lang. Hi Anne, nope, whalesharks are completely safe to swim with.. They are friendly and gentle. Ako kaya kelan makakakita ng whaleshark? Baka hanggang TV or pictures na lang ako. Hehe. Here's my nostalgia entry, sis! wow! saya naman tingnan..ganda mo sis..heheh! mine is up for this week hehe..exciting! Wow! this moments are indeed to be cherished forever Mommy Rose! ganda ng mga kuha nyo. Was also here joining again... its been awhile rin mommy that I haven't join Nostalgia. 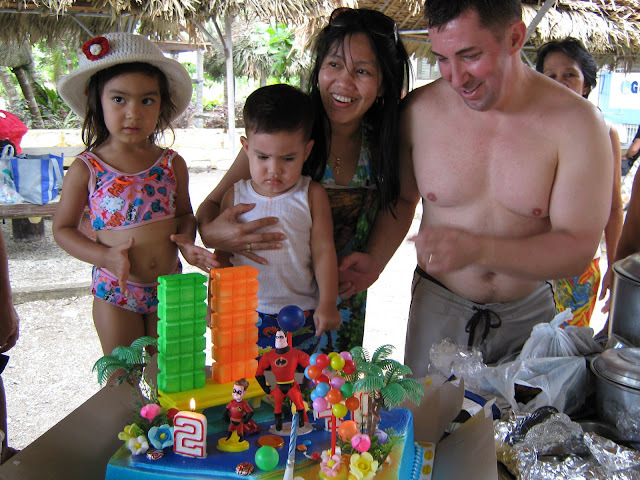 Daddy and son birthday, it sure was fun and it was in the Philippines. tanong ko lang sis, di ba nakakatakot ang butanding? haven't seen one. sa wakas nkasali ako today..I grabbed ur badge pala sis and placed in my badge collection in Unmasked Thoughts. hindi pa rin ako nakakakita ng butanding, tokaya. hopefully next year kapag natuloy iyong plano naming vacation. nga pala thanks in advance. nag-abala ka pa. ok lang kahit wala or kahit ano iyon Tokaya. it's the thought that counts. mwaaah! i have too many places that I want to visit and seeing Butanding would be the best to experience.. how I wish I could swim with them too.